I don't have a huge collection of stamps, but I do love the ones I have and I use them a lot in my junk journals. I was having a hard time storing them. First I kept them in a closed box with a handle- kind of a cardboard version of a vintage train case. Everything fit, but it was kind of a pain to have to pull out the box and open it just to get my distress ink or blending tool. So then I went to a basket to have everything close at hand, but that quickly became a jumbled mess. The other problem was with storing the cling stamps. I tried to keep them on their original acetate sheets and then keep all the sheets in a baggie, but that was also unwieldy. I'd try to get one sheet out and knock stamps off the other sheets. 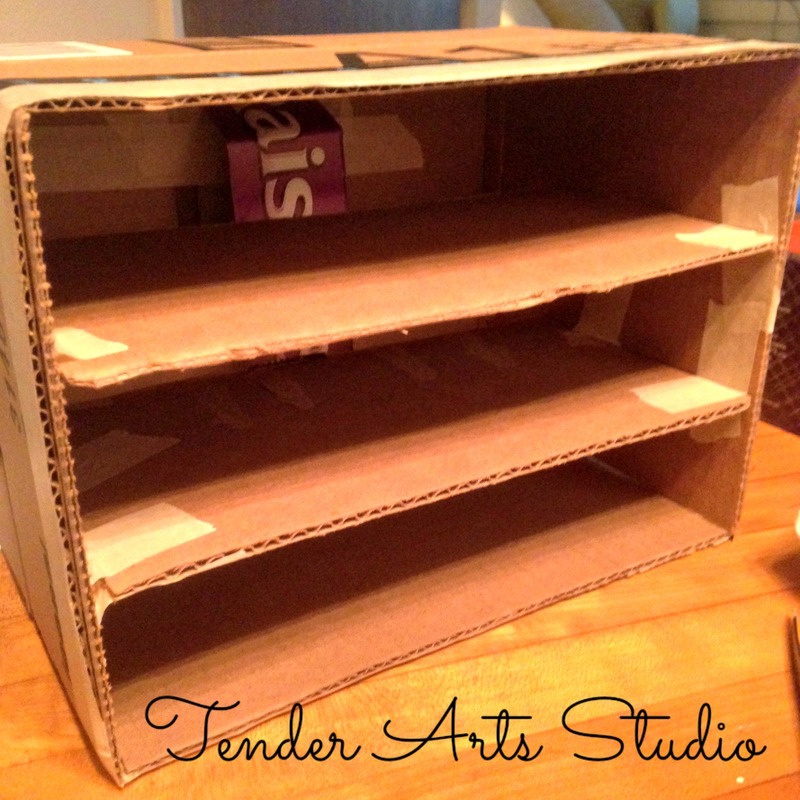 So, what does a crafter do when she needs storage solutions? She hits Pinterest, of course! Here's the idea. 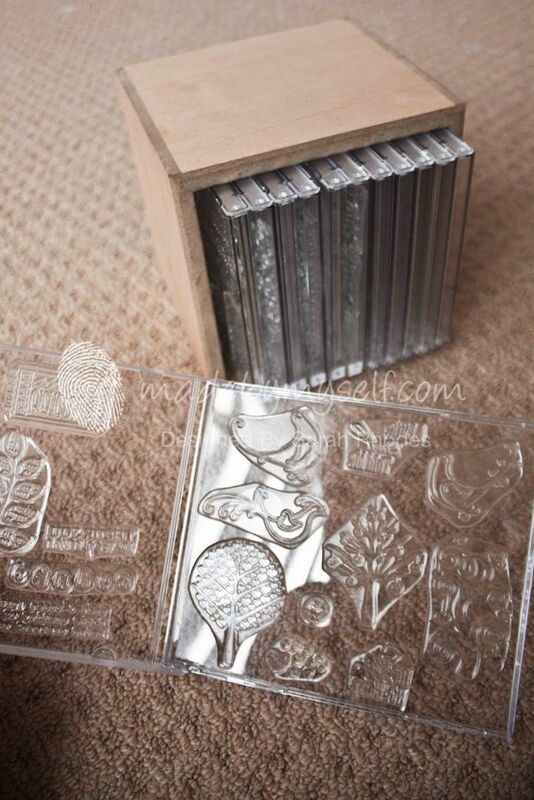 So that was great- I have all my cling stamps in old CD cases (makes me glad now that I hadn't purged all those things! 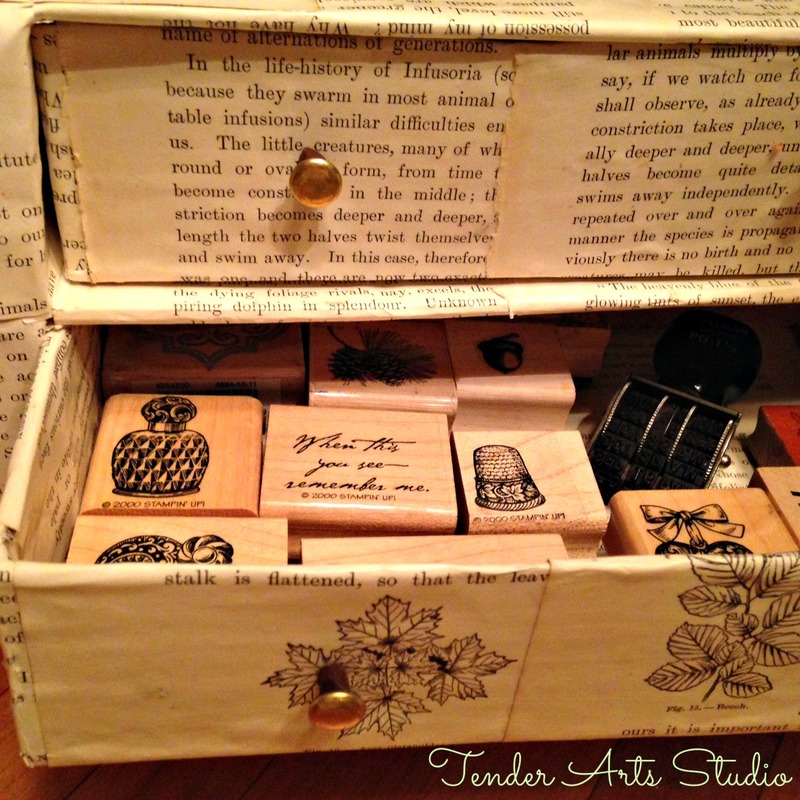 ), but I still had my wooden block stamps, ink pads and tools. I looked at what I had and the amount of space I had and I made a solution! 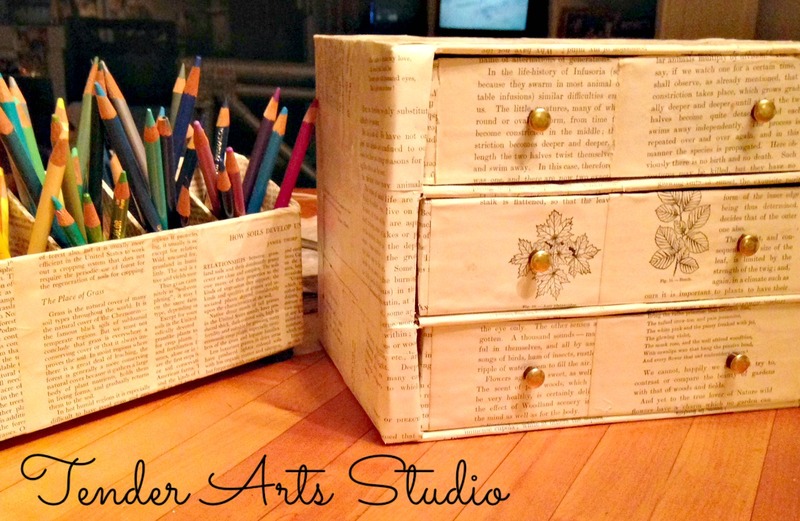 Behold the Amazon Box/Pancake Box/Book Page storage chest! After it was assembled, I gave the whole thing a coat of Mod Podge and added drawer pulls made of brads. I love that now I can just pull out the drawer I need and keep working! I posed the chest with my colored pencil caddy that I made a few years ago. 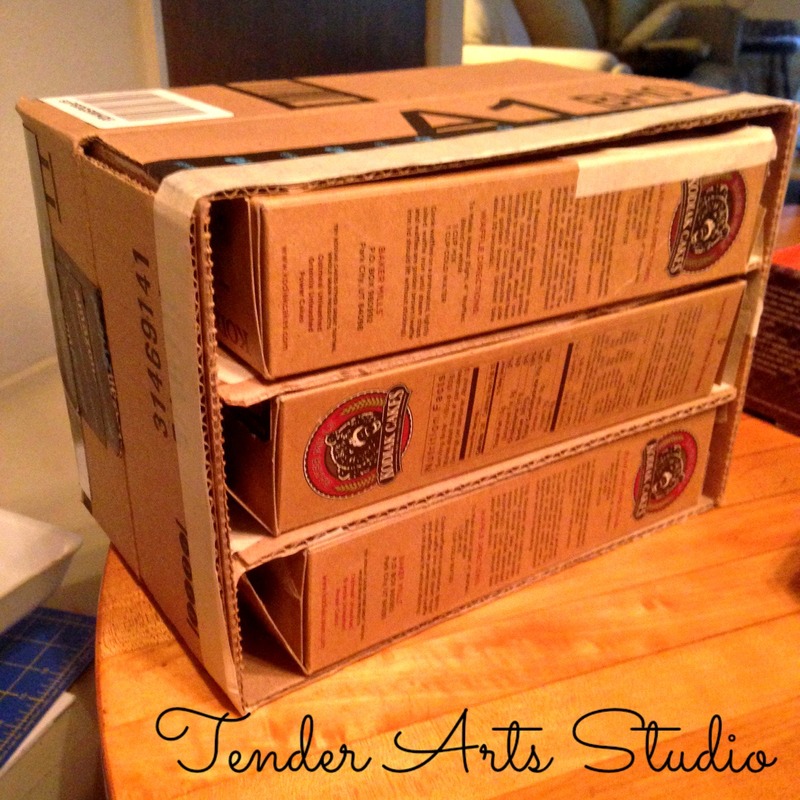 Isn't it great that plain old cardboard, paper and Elmer's Glue can be transformed into something truly useful? I'll enjoy today and let tomorrow take care of itself. Happy making, Friends!